The love birds appear to be kaput after a 14-year relationship. The not-so-happy couple, Liberty and Justice. Screenshot of the eagle cam courtesy of the ECC. On Tuesday, word spread that Liberty, a YouTube-famous bald eagle living above the DC’s police academy, laid her first egg of the year in a joyous moment that, like many 21st century life events, was caught on camera. Yet as Liberty (and those watching the eagle cam live stream) celebrated the moment, one bird was noticeably absent: the soon-to-be-eaglet’s father, Justice. 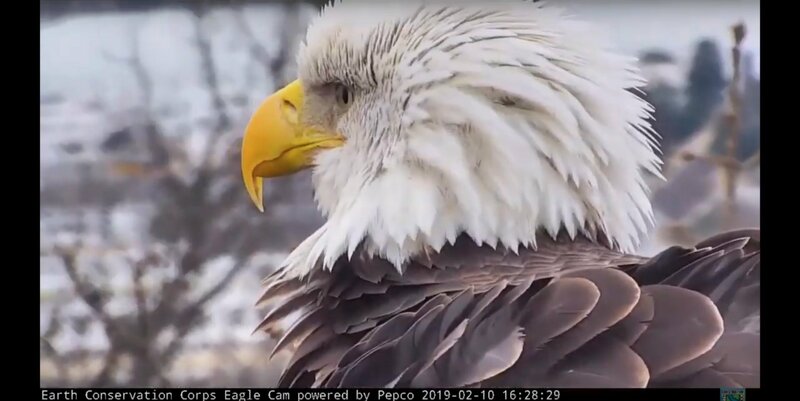 Until this week, the couple has had a pretty normal season, says Tommy Lawrence, managing director of Earth Conservation Corps (ECC), the group that monitors DC’s eagles via stationed live cameras. Justice and Liberty have been together for 14 years, and there was no reason to suspect they wouldn’t spend Valentine’s Day together as usual. But after they pair had an amorous encounter last Saturday, Justice promptly left the nest. While it’s common for him to come and go (he is the breadwinner/hunter in the relationship), this is now the longest he’s been away. Enter Aaron Burrd. Just a day after Justice fled the scene, a new bird with scarred talons and ruffled feathers swooped in to make a move. Named Aaron Burrd by those wacky ECC punsters, the scrappy eagle is suspected to have earned those battle scars during a fight with—you guessed it—Justice. Liberty, however, wasn’t deterred by Burrd’s haggard appearance. According to Lawrence, Burrd as been successful in seducing Liberty at least once. He’s the eagle version of Mr. Steal Your Girl. Can you blame a girl? “Liberty has to weigh her options,” says Lawrence. “Justice is out of the picture and she has a kid to raise.” Based on the timeline, Lawrence is sure that this eaglet is Justice’s. But if Liberty doesn’t lay another egg in the next few days, her next hatchling could possibly be Burrd’s.